The Ching-Kuo is a light-weight multi-role fighter, developed by Taiwan in cooperation with major US aerospace industries. The Indigenous Defensive Fighter (IDF) was named after the late Taiwanese president Ching-Kuo. The aircraft's primary mission is that of air defence carrying the indigenous TienChien (SkySword) I Sidewinder-equivalent and the Beyond Visual Range (BVR) TienChien II. The multi-role aircraft can also be used in the ground attack role or the maritime attack role using its multi-mode Golden Dragon GD-53 radar, which is a license built version of the Westinghouse AN/APG-67(V). For the maritime attack role the aircraft can be equipped with up to three indigenous Hsing Feng II AShM. Internally the Ching-Kuo carries the M61A1 Vulcan 20mm cannon. Developed by AIDC in cooperation with General Dynamics the Ching-Kuo has a lot of resemblances with the F-16 but also the F/A-18 and the F-20 Tigershark. The nose is like that of the F-20 Tigershark housing a similar radar, the sleek fuselage and wing layout from the F-16, whereas the centrally placed side air intakes for the engines are positioned in similar fashion as on the YF-17 or F/A-18. The cockpit strongly resembles the F-16 and it is equipped with a wide-angle HUD, two MFD, a side stick, HOTAS, and has a 30 degree declined Martin Baker Mk.12 ejection seat. The Ching-Kuo is smaller and has shorter range than the F-16. 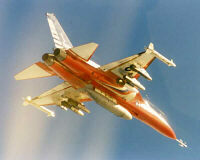 Powered by two license-built 42 kN (9500 lb) TFE1042-70 turbofans, it is underpowered in comparison with other fighters. However the smaller warload compensates for this, although the aircraft's maximum speed is reported to be Mach 1.65 or as low as Mach 1.2 in normal configuration. Initially, two variants of the Ching-Kuo were produced. The F-CK-1A is the designation for the single-seat variant and the F-CK-1B is the two-seat equivalent. Although the B is used for operational conversion and training, it retains its combat capability. Taiwan's AIDC has developed an upgraded variant, designated F-CK-1C/D. The first F-CK-1C single-seat prototype was flown in October 2006, followed by the first F-CK-1D two-seater prototype in early 2007. Both aircraft were demonstrated at a ceremony at the AIDC facility at Taichung on March 27, 2007. At the ceremony President Chen Shui-bian named the new variant the Hsung Ying (Goshawk). The F-CK-1C/D upgrade features a new BAE Systems 32-bit flight control computer, improved mission computer and head-up display, advanced fire control radar system and improved weapons capability. Structural enhancements enable it to carry four instead of two TianChien II (SkySword II) medium-range air-to-air missiles and strengthen the undercarriage. The upgrade also includes two additional fuel tanks in the form of conformal tanks mounted dorsally on the fuselage, first seen on the F-CK-1D prototype. If development trials are successful, the new variant is said to be ready to enter service in 2010, providing the Republic of China Air Force (RoCAF) decides to upgrade to the new variant and funding is allocated to start production in 2008. AIDC hopes to upgrade half of the existing fleet, and also produce new aircraft for the RoCAF. - Green, W. and G. Swanborough (2004), The complete book of Fighters, p. 11-12, Greenwich Editions, UK. - Munro, B. and C. Chant (1999), Collins Jane's Combat Aircraft, p.42-43, HarperCollins Publishers, UK.